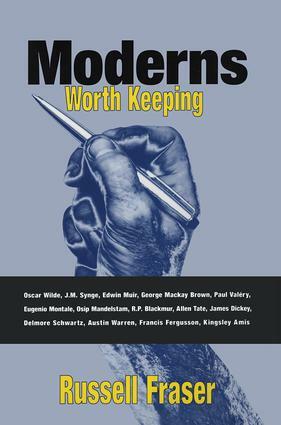 In this new volume, Russell Fraser assembles fourteen twentieth-century writers he judges "worth keeping." All were famous in their time, but many outlived it, enduring an eclipse that Fraser intends this book to dispel. Each of the authors differs in background and in the kinds of writing practiced, and while together they do not constitute a modern canon, Fraser persuasively presents them as a group distinguished by a more than ordinary affiliation for language. Leading off are Oscar Wilde and J. M. Synge, both of whom were Irish and principally known as playwrights. The Scottish poets Edwin Muir and G.M. Brown are complemented by three great Europeans: Paul Valery, Eugenio Montale, and Osip Mandelstam, "mandarins" who wrote for an elite of their time, not a social elite, but readers who could read. The New Critics, who gave language first place in their writing, loom large in this account. R.P. Blackmur and Allen Tate are followed by Delmore Schwartz, Austin Warren, and Francis Fergusson, lesser stars orbiting those greater than themselves. Kingsley Amis the novelist and James Dickey the poet, with whom the book concludes, had a great run at fame and fortune, but ended bleakly. The world was livelier for these writers' presence, and what they left us still gives satisfaction. This heterogeneous group may be said to be our saving remnant. In a time of coarsened feeling, its members possess in high degree the ability to discriminate, seeing acutely, and inspiring feeling where it was dead. Their function is therapeutic, even restorative for the life of letters. To give them a hearing is the principal purpose of the book.